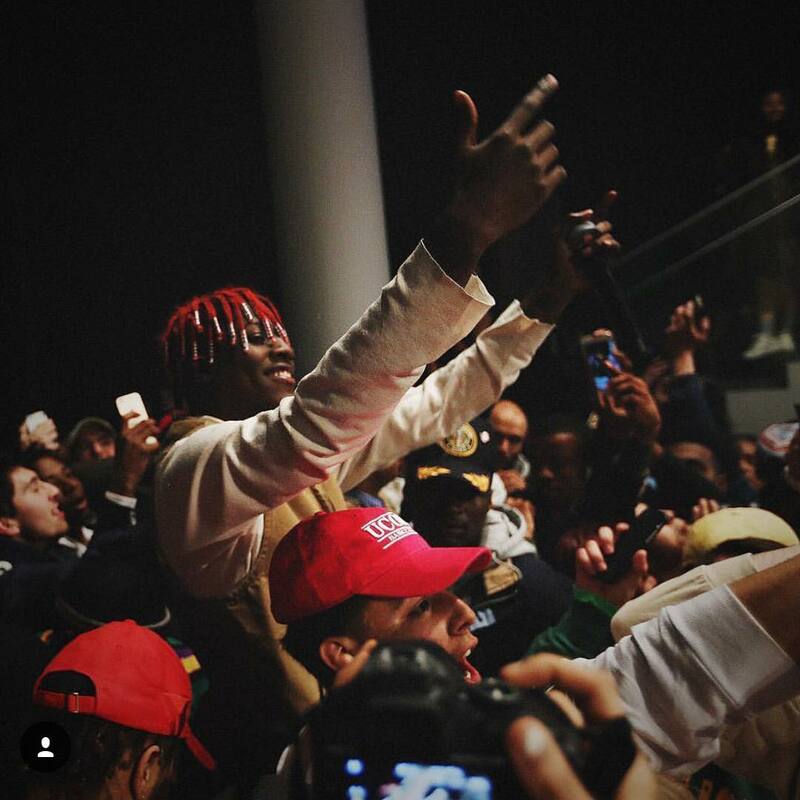 The night (Friday, April 29) ended with the striking Lil Yachty hanging out of a vehicle sunroof, relishing in the roaring approval of a pleased crowd as Museum staff clanged a gate down on satiated ticket holders exiting the building. A show rife with technicality, pregnant pauses and attempts by the event staff to restructure the setting, Yung Jake, ATL super producer Sonny Digital and the illustrious and widely trending Lil Yachty showcased to the revered and prestigious Museum of Modern Art on West 53rd in Manhattan, New York some of their exuberant songs surrounded by a sizable conglomeration on stage and off of even more exuberant fans and associates, proving the literal magnetism that the three artist’s music evokes. Apart of the PopRally series of events at MoMA and MoMA PS1, the show set is described as a grouping of curated gatherings “that serve as a gateway for young and diverse audiences to engage with the Museum”. A diverse and sizable audience undoubtedly appeared and willingly turnt up. Initially, freshly unveiled Views Drake album cuts preceded on a playlist Lloyd Banks “Beamer, Benz or Bentley” as exorbitantly priced paintings hung on the whitewashed walls of the event space. Hip hop sounds filled the location of fine art. Pottery Lite the video game, text messages, Snapchat and a FaceTime performance capped off Slithering Screens: Yung Jake, a creative means of capturing the in tune artist’s showy style and energy. A freeform presentation of the up and coming “Both” songters’ iPhone and a companion device mirrored on two portrait orientation screens was presented to a prior crowd at the Museum as apart of the experience. At the actual concert he was met with a more receptive audience. Sonny Digital, the hugely productive and wave setting producer behind some of your favorite songs and a burgeoning rapper with a current hit under his belt bearing and featuring 50 Cent, kept it completely real just as all the artists did on stage. Throwing the mic in frustration back at the imposing staff dead set on delivering the show the way they envisioned it until the end, Sonny has since denounced the event via Twitter but not before running through a barrage of bonafide hits including the cinematic and harshly intense “Same Time” by Future, musically alluding to the fact that his ties with the hit maker and influencer date back to the onset of his success and forgoing even that, with the blaring of the track “Racks”, a song that exposed him to the world at large. Sonny and his aiding DJ played Rae Sremmurd Sremm Life album cuts, yet the MoMa staff was undoubtedly not privy to the Sremm Life way of turn up and mentality. Totally capacitating infectious energy, all three artists had the crowd eager to move but the event staff was eager to halt the audio on multiple occasions. Yung Jake, Sonny Digital and Lil Yachty all focused on delivering to the crowd what they wanted to hear methodically and rowdily performing their most allured songs to a elegant space that transformed perfectly turnt quickly. MoMa organizers invited Atlanta’s cultural energy and vibe to emanate from the stage, at one point roping off the area and unleashing the beaded red haired figure of the evening on a crowd thirsty for close proximity. Right hand to Yachty and visionary “1night” producer Burberry Perry waltzed on stage with the star as the isolated piano notes of “Minnesota” rang off, they bounced and when the beat slammed down the stage seemed to implode. It’s something about Lil Yachty as an artist that makes purveyors want to rush towards him in complete and utter approval. Simply in terms of image alone, the artist deserves merit due to his individuality, a fact image obsessor and dedicate Kanye West took in to consideration when cosigning him fully during Yeezy Season 3: an artistic statement not unlike what occurred at the MoMa during the relegated concert. It’s telling that the last hosted rap event was a Kanye set in 2011; the few and far between MoMa hip hop concerts showcase a cohesive clashing of worlds that is raw. Rap from an artistic paradigm at one of the worlds most renowned artistic venues sums up the crazy event eloquently .